Located inside of the One King West Hotel & Residence, is one of Toronto’s busiest hotel bars. Teller’s Bar & Lounge is located directly in the lobby of this historic hotel which was formerly the Toronto Dominion Bank. The bar itself incorporates two of the original teller wickets into the design of its tall cruiser tables. With the newly renovated bar & lounge and the hiring of a new Executive Chef in January 2018, it would only be fitting to launch a new menu. Chef Angel Sevilla has a culinary background which includes many years as Executive Chef at restaurants such as The Shore Club and most recently a Chef Instructor at Centennial College. Having several months under his belt, Chef Sevilla is ready to share his influences with the diners at Teller’s! I had the privilege of being invited to preview some dishes from his new menu and I am honoured to share those with you. Here are the items hitting the menu as of today, July 16, 2018! 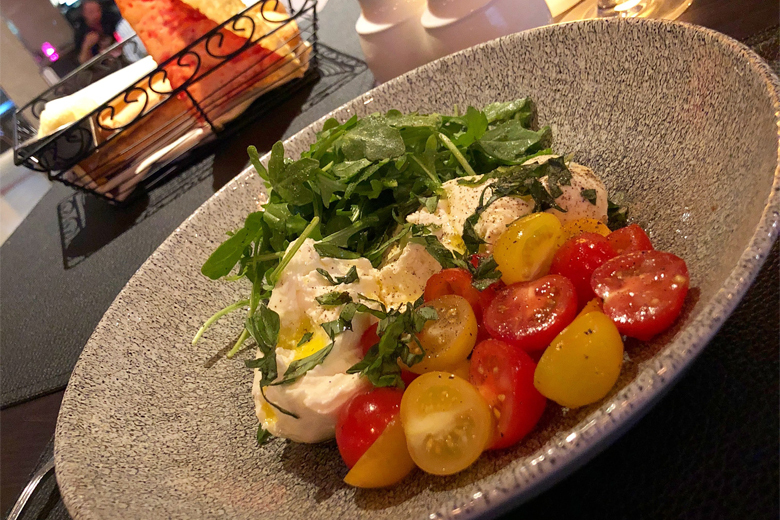 Burrata and Heirloom Tomato Salad – baby arugula, fresh basil, extra virgin olive oil, sweet onion vinaigrette. The fresh Ontario burrata offered a very creamy stracciatella filling which lends itself greatly to this plate. The freshness and flavour profiles were delicious. A great start to the meal! 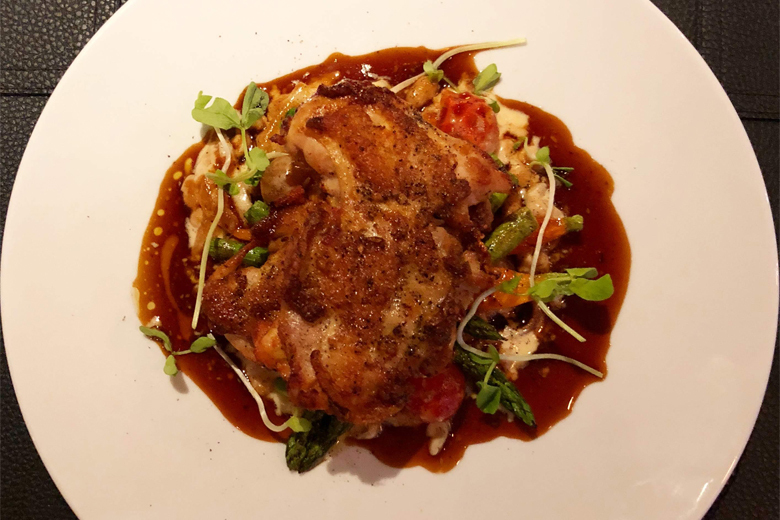 Harissa Cornish Hen – boneless hen, market vegetables, tomato & white bean ragu, red wine jus. This dish was simply perfect. The harissa, or hot chilli pepper paste, was placed under the skin of the boneless Cornish hen, allowing the skin to cook up crispy – a perfect accent to the dish. The ragu and jus went great with the hen and vegetables. Very well executed and perfectly seasoned. 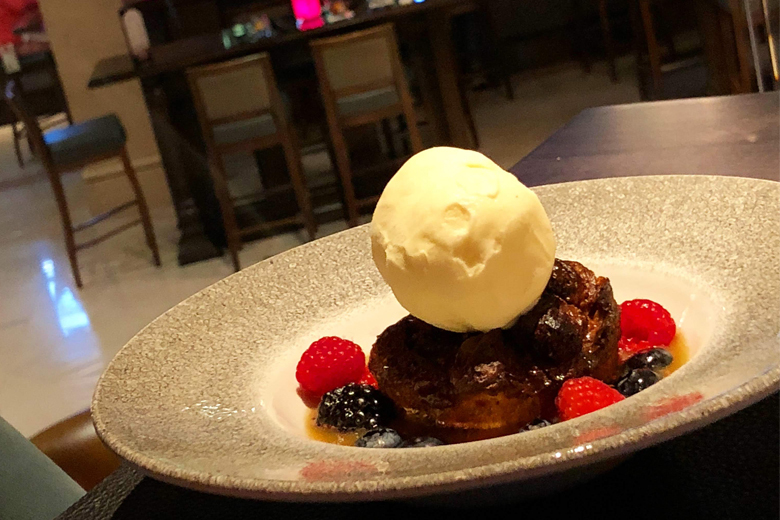 Chef’s Raspberry Bread Pudding – butterscotch sauce, Madagascar vanilla ice cream. I love bread pudding and this one was no exception! The use of croissant, instead of the usual brioche or challah, added richness and some lightness. The butterscotch sauce was perfectly sweet and buttery and made this one of the best bread puddings I have ever eaten! I would like to thank the One King West Hotel & Residence for allowing me to preview some of the amazing items Executive Chef Sevilla launches today. Having tried these three dishes, there is no doubt in my mind that the menu will be a great success! Meeting Gordon Ramsay, The F Word in Hollywood!